A bag doesn’t have to be a complex piece of equipment. Sometimes, you just want your bag to be nice and simple. Especially when you’re travelling. Annabel Trends’ new Triple Zipper Travel Bags are just what you’re looking for! These attractive, yet uncomplicated little bags were made with simplicity and practicality in mind. With three overlapping zippered compartments of different sizes, the Triple Zipper Travel Bag has a deceptive amount of storage room. It’s compact, but, at the same time, there’s room for all your essentials. It’s also really useful, with a long, adjustable strap that you can just sling over your shoulder. Simple, stylish, the Annabel Trends Triple Zipper Bag is your ultimate travelling companion. Made from nylon with polyester lining. Three zippered compartments overlap each other – two smaller pockets are on the front of the bag, and the third zipper is located at the top of the bad. 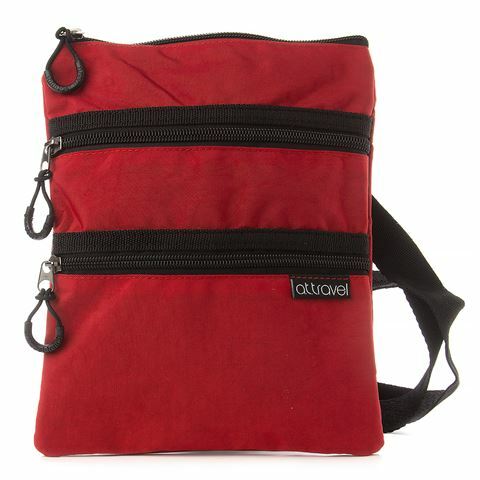 Includes a long, detachable shoulder strap you can adjust to suit your needs and height.